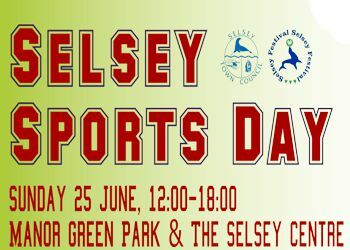 Selsey Town Council are delighted to present their Selsey Sports Day - a free family event full of sports, activities and entertainment - hosted at The Selsey Centre and Manor Green Park. Family Fun Run - from 11am until 12pm we want to see how many Marathons Selsey can run in one hour! 2 laps of the course and you'll have done 1Km, take part as a family and run as a relay, however you get involved just GET INVOLVED! To register visit www.chichester.gov.uk/familyfunrun - all those that register will be entered into a prize draw and receive a medal when they complete the run. FREE Climbing Wall - do you have a head for heights? ARO Kickboxing will be holding displays and taster sessions, they hold a range of different classes in Selsey so come and have a go. Zumba - one of our local Zumba classes will be giving displays and taster sessions througout the event. The Dance Club will be running some displays and taster sessions, don't worry if you have two left feet come and get involved! VRcade is the newest addition to Selsey providing virtual reality experiences and gaming for events and parties. Please note some charges may apply. East Beach Social Club will be attending, see how you can get involved with your local Skate and Scooter park. There willl be entertainment, street food and a licensed bar througout the event so come and enjoy one of your many local parks for the day.